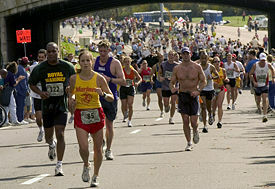 The 29th annual U.S. Marine Corps Marathon had almost 18,000 people running in Washington, D.C. in 2004. Physical fitness has historically been required of all military forces. Physical fitness is used in the context of two meanings: General fitness (a state of health and well-being) and specific fitness (the ability to perform specific sports or occupational skills). Fitness can be further subdivided into five categories: Cardiovascular endurance, muscular strength, muscular endurance, flexibility, and body composition. The criteria for physical fitness has also expanded to include the capacity to meet physical demands in an emergency situation. Physical fitness is the capacity of the heart, blood vessels, lungs, and muscles to function at optimum efficiency. In previous years, fitness was defined as the capacity to carry out the day’s activities without undue fatigue. However, with increased leisure time, and changes in lifestyles wrought by the industrial revolution, which took a large proportion of the population away from farm life and into more urban areas, this definition is no longer considered comprehensive enough. Many health professionals today, including doctors, nurses, occupational therapists, and physical therapists, agree that the ideal approach is a holistic approach—one that provides many options and allows a person to make decisions and be proactive in regards to their own personal health. 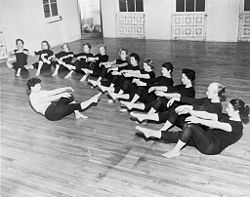 Bonnie Prudden, American rock climber and physical fitness advocate, leads a class in exercises in 1956. The evolution of fitness can be attributed to humanity’s need for survival and can be traced back to the beginning of humankind. During the Paleolithic and Neolithic Ages, physical fitness was all about survival. From 2500-250 B.C.E., people started relating physical activity with physical well-being. In China, through the philosophical teachings of Confucius, they associated certain diseases with physical inactivity. This lead to the development of Kung fu gymnastics. During the same period, Yoga was developed in India. Yoga is an exercise program that conforms to Hindu and Buddhist beliefs and puts emphasis on spirituality. During Greek times, physical fitness was linked to beauty, athleticism, and physicality, thus the Olympic Games were born, where fitness was rewarded. And even during colonial times in early America, farming and its many tasks kept the whole family fit; albeit without the accompanying benefits of modern day medicine. However, the Industrial Revolution took large portions of the population into the cities, often times to work in unhealthy and unsafe environments. The rise of industry, even the invention of the elevator, conspired to create sedentary citizens of the computer age. During the 1950s, the concept of physical fitness came into the national limelight when President Dwight D. Eisenhower established the President's Council on Youth Fitness in 1956. Shortly before he took office, President-elect John F. Kennedy called physical fitness a defining principle of his administration. He published "The Soft American," in Sports Illustrated (Dec. 26, 1960) less than a month before his inauguration. Within a month of his inauguration, President Kennedy spoke at the Conference on Physical Fitness of Youth. Under Kennedy, the President's Council would not only spread the word to Americans about the importance of physical fitness for youth but would also conduct youth fitness surveys, publish fitness information, and offer technical advice to schools and communities about how to improve physical fitness not only for youth but for Americans of any age. Americans, in the 1970s, were engaged in a fitness craze. Aerobics, dancing, isometrics, stretching, jogging, walking, bicycling, swimming, yoga—Americans increasingly worked out. By 1977, a record 87.5 million U.S. adults over the age of eighteen claimed to participate in athletic activities. The most visible sign of the fitness boom were some eight million joggers who trotted along big-city park paths and suburban byways. The trend of fitness related businesses started in the late 1990s. Visiting a gym or a health center or even buying fitness equipment became the norm. 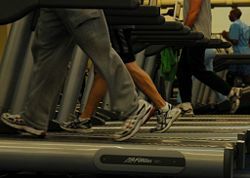 Although the boom in gym membership leveled off in the 1990s, the fitness field still is a large and growing industry. As of July 2003, there were 22,000 health clubs, fitness centers, and gyms in the United States, with 36.3 million members. Keeping fit was a $13.12 billion business in 2002. In the twenty-first century, the popularity of organic farming and the banning of trans fats were a result of fitness awareness, but still a majority of the American population is not deemed fit. According to a statement made by the American Council for Fitness and Nutrition in 2008, an epidemic of obesity is compromising the lives of millions of American children. According to Dr. Brian Wansink, then executive director for USDA's Center for Nutrition Policy and Promotion, "The increasing problems of obesity and poor eating habits among America's children are undoubtedly complicated issues, but what is often overlooked is the one place where a deliberate, positive trend toward change could take place tonight—the family home." He concluded that, "By connecting with families to help them make better food choices and encourage more physical activity, we can make an immediate change with lasting impact." 1. Cardiovascular endurance: This is the ability of the body to deliver oxygen and nutrients to tissues and to remove wastes over sustained periods of time. CE can be improved through aerobic exercise; those performed at a moderate level of intensity over a relatively long period of time such as running or playing tennis. Airmen from the 8th Fighter Wing in South Korea use cardio equipment at the base fitness center. 2. Muscular strength and endurance: Strength deals with the ability of the muscle to exert force for a brief time period, while endurance is the ability of a muscle, or group of muscles, to sustain repeated contractions or to continue to apply force against an inert object. Weight training provides the means to develop both the strength and size of skeletal muscles. 3. Flexibility: This denotes the ability to move joints and use muscles through their full range of motion. Flexibility may be increased through stretching. Hatha Yoga and pilates are whole body workouts that focus on flexibility and balance. 4. Body composition: Composition refers to the body in terms of lean mass (muscle, bone, vital tissue, and organs) and fat mass. An optimal ratio of fat to lean mass can be determined by a person's body/mass index. A person's BMI is a more accurate method of determining whether a person's weight is healthy in relationship to their particular body type. Performing the right set of exercises can help people convert fat through increasing muscle mass. In the case of athletics, terms such as accuracy, agility, coordination power, speed, and stamina are appropriate. Many sources also cite mental and emotional health as an important part of overall fitness. This is sometimes presented as a triangle made up of three sub-sections, which represent physical, emotional, and mental fitness. The ideal triangle is balanced in all three areas. Like the food and nutrition pyramid designed for healthy eating, the "triangle" is in alignment with practitioners today that wish to address a more holistic approach towards health and aging. Specific or task-oriented fitness is a person's ability to perform at a specific activity with a reasonable efficiency, for example, in sports or in military service. Specific training can prepare either an athlete or a worker in their particular field or sport. Examples of athletic training would be: Training for a 400m sprint—in which case a runner performs at ultimate speed throughout a short distance. In the case of a sprinting, the athlete must be trained to run anaerobically throughout the race. In a marathon, which covers a long distance, the athlete must be trained to work aerobically; endurance must be increased to the maximum. Anaerobic exercise is used by athletes in non-endurance sports to build power and by body builders to build muscle mass. Muscles trained under anaerobic conditions develop differently, leading to greater performance in short duration, high intensity activities, which last up to roughly two minutes. Aerobic exercise, on the other hand, includes lower intensity activities performed for longer periods of time. Firefighters and police officers must undergo regular fitness testing to determine if they are capable of the physically demanding tasks required for their jobs. In the Scouting programs of some countries, students can earn fitness badges, such as the Physical Fitness Badge which is earned in the United States by both boy and girl scouts. Families can stay physically fit together by finding activities that everyone in the family can take part in. Many communities provide outlets for family participation in swimming, such as the YMCA or the Boys and Girls Club at a reasonable cost. Small towns as well as large cities often have biking or walking trails. A local Department of Parks and Recreation is a good resource for learning about a variety of outings from hiking to skiing to snowshoeing. Camping can also be a popular family activity that gets everyone outdoors. Parents can provide numerous opportunities for a child's physical fitness development. Young children are developing gross motor skills by playing on playground equipment, by learning to ride a bicycle, or by roller blading, or skating. Parents contribute to their children's overall physical fitness development by taking them for regular physical checkups to a dentist, family physician, or chiropractor. When it comes to being physically fit, parents serve as important role models to their children. In many high schools participation in physical education programs (what used to be called Gym class) is still a graduation requirement. However, many school districts have eliminated their budget for physical education classes and some students simply do not participate. Some schools, in an effort to be more academically challenging have even eliminated recess. If parents are in a position to choose schools or a school district for their children they might want to keep in mind its contribution to the overall physical fitness of their children. With childhood obesity on the rise and the popularity of sedentary activities in the computer/television age, community sports such as baseball, soccer, and basketball can provide an important outlet for children. An interest in sports can contribute to a child's growth and development in more ways than one. By keeping physically fit, meeting new friends, and learning new skills, children can develop habits that will stay with them throughout their lifetime. Recent studies have shown that contrary to conventional wisdom, it is often children in rural areas who lack exercise since parks, walking to and from places, and organized activities may be limited. There are simple ways, however, that exercise can be incorporated into a child's leisure time, whether through exergaming, installing a basketball hoop or other equipment indoors or outdoors, or even just playing with a family pet. For working adults who are busy with their daily lives, keeping fit is challenging. Recent recommendations suggest that adults engage in moderate-intensity physical activities for at least 30 minutes on five or more days of the week or in vigorous-intensity physical activity three or more days per week for 20 or more minutes per occasion. A good way for adults to meet the physical fitness challenge is to join a fitness center, a gym or the local YMCA or YWCA. When these options are not convenient small changes can be incorporated into a person's lifestyle such as walking the family dog, walking at the mall, or walking up stairs. The important thing is to keep moving. As people age, their metabolism slows and caloric adjustments need to be made accordingly, by watching portion control when it comes to eating. Annual visits to a family practitioner can help a person monitor their blood pressure and cholesterol levels and make sure they are on track with other special tests they might need. The burgeoning popularity of alternative therapies that take a preventive approach towards health is growing, and they can help, whether it is through suggesting vitamins or supplements or offering self care services such as massage, acupuncture, or naturopathy. Many who are less motivate are now turning to a personal trainer, who can motivate and monitor a personal exercise and diet regimen. The physical activity pyramid is a good reference for seeing what type of activities are recommended and how often. Seniors can enjoy most of the activities they did when they were younger including: golf, swimming, and walking. They can even take up some new activities such as yoga or water aerobics. Many senior centers or retirement homes offer exercise classes for seniors which have all the moves of a more intense class but are done slower or sitting in a chair. It is critical for seniors to keep working at their balance, as falls are a major concern for the elderly and a leading cause of injury. Scientists have proven that being active can help with chronic conditions and help to reduce the risk of obesity, high blood pressure, diabetes, osteoporosis, stroke, depression, colon cancer, and premature death. Studies have shown a correlation between the physical activity level of seniors and their mental health as well. The elderly are often subjected to feelings of depression, loss, and sadness as they face the challenges and adjustments associated with aging. Being physically fit can make all the difference, and as a large proportion of the population ages and works past the traditional retirement age, it becomes all that more crucial. ↑ ABC of Fitness, Fitness History. Retrieved June 17, 2008. ↑ John F. Kennedy Library, The Federal Government Takes on Physical Fitness. Retrieved June 17, 2008. ↑ BookRags.com, Aerobics to Yoga America 1970-1979: Medicine and Health Research Article from American Decades. Retrieved February 12, 2015. ↑ Eric Durr, Owners say area fitness business is in top shape. Retrieved June 17, 2008. ↑ U.S. Department of Agriculture Center for Nutrition Policy and Promotion, Action Kit Retrieved February 12, 2015. ↑ National Institutes of Health, Calculate your Body Mass Index. Retrieved February 12, 2015. ↑ Jonathon Hardcastle, The Importance of Physical Fitness. Retrieved June 15, 2008. ↑ Parents as Teachers, Homepage. Retrieved June 17, 2008. ↑ What's Really Making America's Children Fat? TIME Magazine (Special Health issue) June 23, 2008. ↑ 11.0 11.1 Medicine Net, Fitness at Any Age. Retrieved June 17, 2008. ↑ www2.gsu.edu, the Exercise and Physical Fitness Page. Retrieved July 2, 2008. Ahlawat, Ravindra Pal. Health Education and Nutrition. Khel Sahitya Kendra, 2009. ISBN 978-8175245563. Bogert, L. Jean, George M. Briggs, and Doris Howes Calloway. 1973. Nutrition and Physical Fitness. Philadelphia: Saunders. ISBN 0721618170. Ettinger, Walter H., Brenda S. Wright, and Steven N. Blair. Fitness After 50. Champaign, IL: Human Kinetics, 2006. ISBN 0736044132. Greenberg, Jerrold S., and David Pargman. Physical Fitness: A Wellness Approach. Englewood Cliffs, NJ: Prentice Hall, 1986. ISBN 013668856X. Halper, Marilyn Snyder, and Ira Neiger. Physical Fitness. New York: Holt, Rinehart & Winston, 1981. ISBN 0030482917. Kolata, Gina Bari. Ultimate Fitness: The Quest for Truth About Exercise and Health. New York: Farrar, Straus and Giroux, 2003. ISBN 0374204772. Sharkey, Brian J. Fitness and Health. Champaign, IL: Human Kinetics, 2002. ISBN 0736039716. President's Council on Physical Fitness. This page was last modified on 27 March 2019, at 15:11.